Naked Safety – Exploring The Dynamics of Safety in a Fast-Changing World. I am not sure about this. “Mental error” reminds me of “human error” and this reminds me of “blaming the worker”. I am not saying that workers are blameless but I am also not sure that we should be “working around these behaviours” rather than examining the design of the work task, work environment and the social connection device. Shouldn’t we be looking at integrating the behaviour into workplace productivity? Gesinger changes the format of most of one chapter into an imagined debate over different safety management systems, contrasting Deming to Heinrich. This willingness to break up the tone is a great move supported by the use of text boxes that read like marginalia or Deadpool breaking the fourth wall. Many of those sellers carry an arrogance, air of superiority and inflated ego that limits the application of the bits of BBS that could have long-term benefit. Looking again at Gesinger’s book for this article I was reminded of the power in the last paragraphs of each chapter. He wraps up the chapters’ topics really well to the point that you can refresh yourself on his thoughts by reading just these paragraphs on a regular basis. 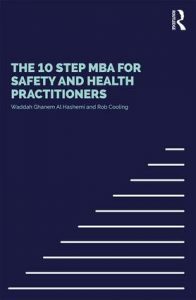 by Waddah S Ghanem Al Hashmi, and Rob Cooling because OHS professionals are constantly being advised to talk about safety in a language that the senior executives and Boards understanding, and I thought this book might help. I am really enjoying this book as provides me with an insight into the C-Suite without having to pay for a Masters of Business Administration (MBA) and even if enrolled in that course OHS is unlikely to be featured. The authors pick just the right tone for imparting information without sounding patronising or causing the reader to have a business dictionary or a thesaurus with them. The book is also as current as a published book can be. The Preface was written in October 2017 allowing the book to be one of the first to spend some time talking about the role and impact of the latest Standard for OHS Management Systems – ISO45001, which is a major advantage. Even though the Standard was not finalised in October, the elements of Leadership and Commitment were developed enough for the authors to discuss. POW and Hallelujah! “Get the basics right”. The next generation of OHS professionals should realise that becoming a National General Manager of HSE is a worthy ambition but there remains a career in teaching and enforcing the basics, and the reapplication of OHS basics to the next wave or generation of workers. Many OHS professionals have already noticed an intolerance in young workers to being spoken to in a manner that some would describe as “traditional”, others “character building”. Young workers are less likely to accept work that involves unnecessary hardship – why lift when we are supposed to provide trolleys?, why work alone without, at least, some sort of electronic monitoring?, Why inspect the plumbing under a house when we can use a camera?, Why work on a ladder when we can use a small personnel lift? …. These are examples of the OHS basics that are expected by new and young workers. They illustrate that basics are evolving all the time. Some of us would acknowledge this is, or is a consequence of, continuous improvement, which is both a legislative requirement and a successful business sustainability strategy. It’s a good way to think of one’s OHS obligations and the social context of those obligations. This 10 Step MBA is terrific and won’t take long to read but will require a lot of time to digest in one’s own context. Someone needs to organise for either, or both, Waddah S Ghanem Al Hashmi and Rob Cooling to feature in Australian and New Zealand OHS and business conferences over the next 18 months. 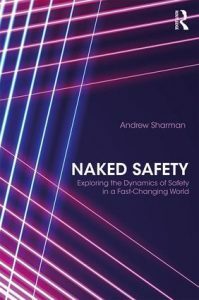 The last book from Routledge is due for publication until July 24 2018 but the abstract to Naked Safety – Exploring The Dynamics of Safety in a Fast-Changing World sounds like it is another of those books that challenge the OHS discipline and may jolt it out of its complacency and comfort. The author, Andrew Sharman, has now written a couple of books related to safety and has a TEDx talk about our culture of fear. Andrew Hopkins is particularly praiseworthy of the book’s “knockout first chapter”. The publishers obviously knew who to send preview copies to. 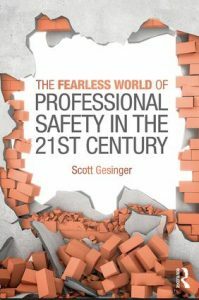 From the topics listed in his new book and his measured manner seen in his TEDx talk, this book looks like it will give serious, but not ponderous, consideration to health and safety, regardless of the provocative marketing tile of “Naked Safety”. It is hoped that the book is based on evidence rather than speculation but if it spurs uncomfortable discussions, it could be another book on the OHS Professional’s List of Essential Books (even it is only available in hardback with a price of over A$100! ).